Traditional Chinese Medical Theory (TCM) dictates that all of the energies in the body must be balanced relative to one another in order for there to be good health and vitality therefore, the Yin (substance) must be balanced with the Yang (organs) and must harmoniously work in unison, and the Shen (emotions) must be calm to truly be well. Yin is substance to the body; like a log is substance to a fire. Yang is the fire(energy) that is fueled by Yin. It is necessary to first rebuild the Yin so that the Yang energy can burn long and bright. There is no absolute Yin, or absolute Yang, there is a bit of Yin in Yang, and there is a bit of Yang in Yin. You can see some Yin inside of the Yang as well as Yang inside of Yin. Yin and Yang theory dictates that the right balance is necessary. The circular fish tail in the Yin/Yang symbol demonstrates that Yin and Yang are flowing and ever changing; extreme Yin will transform to Yang, and vice versa; the body cannot be suspended in a state of homeostasis. This is demonstrated in the body by a sprained ankle; first, the ankle is hot and inflamed. As this Yang condition transforms to Yin, the swelling goes down and the ankle becomes stiff. All disease patterns will pass through Yin and Yang phases until resolved. 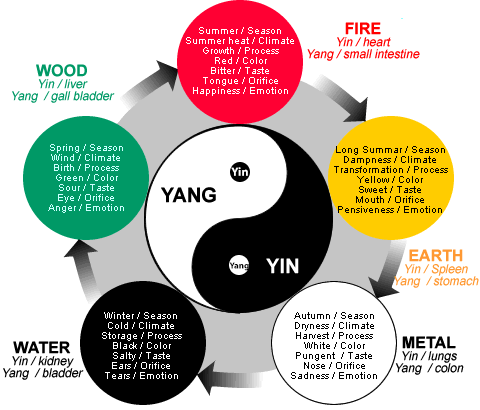 The root of many of the ideas within Chinese medicine lies in the concept of Yin and Yang. Yin and Yang are emblems of the fundamental duality in the universe, a duality that is ultimately unified. Yin and Yang are complementary, and not contradictory. Nor is one regarded as 'good' and the other 'bad'. People will often state that, “I am Yin”, or “I am Yang”, but this would be inaccurate; they may have a Yin-Yang imbalance or tendencies, but everyone has both qualities. Many people recognize that they are cold or Yang Deficient and attempt to take a Yang tonic by itself only to develop Deficient Heat signs such as afternoon or evening sweats or fevers, or they become anxious or agitated. In Chinese medicine, it is always important to build Yin before attempting to build Yang because your body lacks the substance to support the fire. The Kidney energetic organ system is the basis of all Yin and Yang in the body. This is why Kidney tonics are employed when reinforcing Yin Yang qualities anywhere in the body. If there are Deficient Heat signs such as afternoon or evening sweats or fever, begin with only Yin Valley formula until these issues are resolved completely. Always remember that Yang Deficiency is rooted originally in Yin Deficiency; you cannot completely resolve Yang Deficiency without resolving Yin Deficiency. Many people relate Yin only with cold and wet. There are herbs with very cold qualities, which might be classified as Yin, but Yin Valley formula supports the substance aspect of Yin and does not contain extremely Cold herbs. With chronic conditions Yang indications are typically not derived from a 'True Heat', but rather from a 'False Heat'. This occurs because the cooling Yin qualities of the body have been depleted, and the relative imbalance creates Heat. True Heat would more likely be indicated by a virulent fever or infection. The theory of Yin-Yang finds its origins in Taoism, and The Tao is an undifferentiated whole; it describes how things work in the universe and how things work in our bodies. Again, it must be understood that things are only Yin and Yang in comparative situations. An example: warm liquid is Yang compared to cold liquid, but warm liquid is Yin compared to hot liquid. There is no absolute Yin or absolute Yang as each must contain a bit of the other. Furthermore, Chinese medicine does not recognize cause and effect separately; rather, Yin and Yang are constantly transforming in to each other. Their dependence on one another make them inseparable; Yang makes things happen; Yin provides the material necessary for things to happen. Our culture is enamored with Yang qualities demanding that all of us maintain the energy and stamina of our warrior years, even as we age. There is no time for reflection or introspection in life as these are not seen as 'productive' states. We are rewarded by being aggressive and ambitious, often driving ourselves to states of exhaustion that are hard to recover from such as adrenal exhaustion. We also tend to think of the sun in our face, and the wind to our backs; Therefore, wouldn't the front be Yang? The anterior, or front of the body in Chinese medicine is where the Yin acupuncture channels run, and the posterior is where the Yang acupuncture channels run generally. The Yin organs are also situated in more of an anterior position. As stressed so many times, Yin and Yang are relative to each other, so the general classifications as listed above can only truly be understood when there is an actual comparison of Yin and Yang. Water is more Yin than fire; but cold water is more Yin than hot water...so you cannot say that water is absolute Yin. There is not "absolute". We tend to look down upon Yin qualities, as if the feminine qualities of Yin would make one appear to be weak. In truth, there is great strength in invoking Yin qualities in life; it is often more productive to sit quietly and allow things to manifest in to your life rather than running after every opportunity that crosses your path. Cultural judgments aside, embracing Yin qualities is necessary with healthy aging; middle age is a time to slow down and savor the efforts of our more productive times; our elderly years are a time for reflection. It is unrealistic to think that we can bound through life as we did in our 20’s, and unwise to try.